Discussion in 'Vegas Trip Reports' started by AshleyDice, Aug 17, 2018. My wife (32F) and I (31F) had our one-year anniversary at Encore for four nights. We had previously spent our honeymoon doing the same Encore trip. All together, we’ve been to Vegas five times and Reno two times since meeting a few years ago. I'd been to Vegas twice before we met. Cost: all-in, including transportation, lodging, entertainment, food, etc, we spent $8500. That includes our bankrolls of $1600 each. My wife left with $400 of her bankroll and I actually won $500, but we don’t return any of that to offset the $8500, we just add it to next trip’s bankroll. Lodging: we went with Encore, our favorite casino resort in the world. We prefer it to Wynn because it’s more intimate, has the Players Lounge (a special casino pit with couches and dealers in classy black dresses), sometimes has lower limits than Wynn, doesn’t get much tourist traffic from the strip or Palazzo, and it has natural light from the pool and the atrium next to high limit. Both Wynn and Encore are on the quieter side, but Encore even more so. We got the Panoramic Suite, which is the same as the regular Resort Suite, just on a higher floor. Comps: at the end of the trip I spoke with the on-duty casino host about comps. He gave me $150 and my wife $100 off our bill. I felt that was more than generous. While we did give them a ton of play (maybe 6 hours a day), we’re low rollers. I play craps, blackjack, baccarat, pai gow poker, pai gow tiles, and three card poker. My wife plays craps, blackjack, pai gow poker, three card poker, roulette, and slots. She goes to sleep earlier, which probably explains the difference in comps. Sun: started the day at Jardin. A beautiful restaurant but I find their options a little bit limited. Subtract alcohol and eggs and half the menu is gone! After that we went to the spa. Super beautiful and relaxing. I got my hair cut and styled at the salon, followed by makeup. My wife got a blowout. We both felt great after that and took lots of pictures. We headed over to Bellagio to play craps and eat dinner at Prime. We were nearly alone on the patio facing the fountains. Food was just amazing. The filet we split was an earthy brown on the inside. I wonder if that’s from dry aging, or from doing it sous vide. Either way the best filet I’ve ever had. After that we went to Caesars to see Absinthe. It was super loud, but the show was fantastic. After the show we met with a colleague of mine in Caesars who was in town for a conference and showed him how to play craps. We finished the night at Encore, gambling mostly in the Players Lounge. Mon: woke up a little hung over to a room service breakfast of bacon, hash brown, and beignets. We went to check out Red Rock Casino but left in a grumpy state after an hour because of how loudly they play country pop in there, as well as commercials for their Players’ Card, which sounds just like a bad radio station ad, and creates a terrible atmosphere. For lunch we ate at Charlie’s Bar & Grill, and checked out Wynn’s completely redesigned sports book. The hot dog was great. I decided to get my first ever massage at Encore spa. It was beyond amazing, so profesional, so skilled. I used the hot tubs and reading room too. My wife took the opportunity to nap. After gambling more at Encore we went to the buffet. We ate too much! But it was amazing. 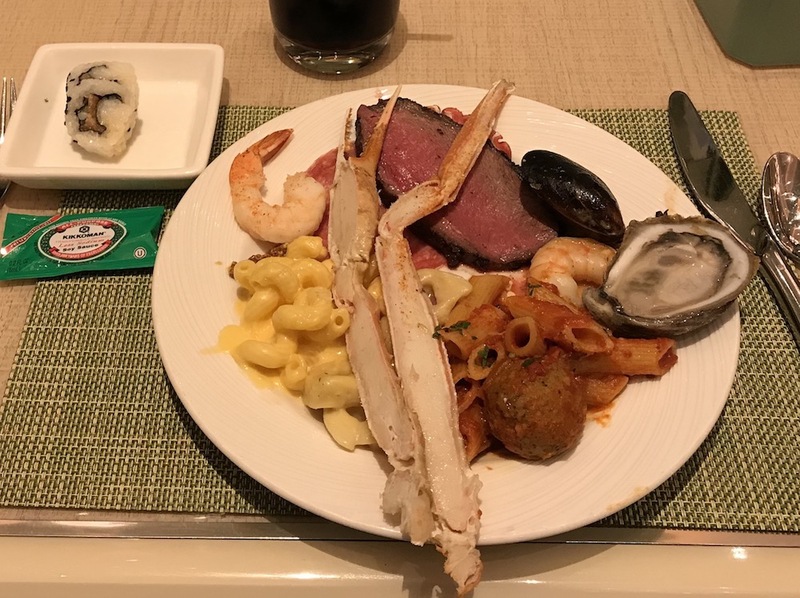 I made sure to get plenty of crab legs this time, while my wife was given a personal tour from the chef to show her what was safe to eat. He even offered to personally cook any item separately to make certain there was no cross-contamination with shellfish. We both felt uncomfortably stuffed after that. Gambling in the Players Lounge rounded out a great day. Tues: woke up to a delicious mango from room service. They day before they said no mangoes were ripe. If they don’t have a perfect mango, they don’t serve it We walked to to Venetian/Palazzo. We ate lunch at Grimaldi’s which served a wonderful thin crust pizza in a NY themed setting. We toured the mall, got some Honolulu cookies, and gambled in the Venetian. It was a little hectic in there for my taste. However, you can play in the high limit room for only a $50 bacc bet, which I thought was a great value. Next we did the Star Wars virtual reality attraction, which we loved. After that we went to Palazzo. I liked that Palazzo was less crowded, with fewer tourists running through. I played some $25 Pai Gow Poker in the green chip pit next to the high limit room while wifey played slots--she was very excited to find a Casablanca machine. We canceled our dinner reservations at Lakeside and decided to get room service. I ate a delicious Reuben sandwich with chicken noodle soup and she ate a cheese melt with tomato soup. We finished the night in Encore’s Player Lounge as usual. Weds: we started with room service of scrambled eggs and english muffins. While my wife packed I talked to the casino host who gave us some great comps off our room bill. I played some bacc in the high limit room, winning $300 as a fantastic sendoff. My wife, on her way out, placed a single $100 blackjack bet and got dealt a ten and an ace, blackjack! It was a great moment. The black Escalade took us to McCarran and we were on our way! Lessons learned: sleep in or you won’t feel right the rest of the day. Don’t try to eat too many high-end meals, they’re just too rich and leave us feeling overstuffed. Don’t go to the nightclubs if you’re expecting the same kind of personalized friendly service you get elsewhere on property. They’re pretty gruff, probably from dealing with drugged out 20-somethings. And the biggest lesson of all: spend a little extra to get exactly the trip you want. Encore charges a premium but to us it’s more than worth it. Happy Anniversary!! Wonderful report; I just wish I could see your photos . How did you insert them? When I upload the photos I get "Your content can not be submitted. This is likely because your content is spam-like or contains inappropriate elements. Please change your content or try again later. If you still have problems, please contact an administrator." Oh right, I believe it is an issue with new user and minimum posts...that last photo came through. When I upload the photos I get "Your content can not be submitted. I sent you a Private Message to try to find out what is going wrong and preventing you from photos photos. Meanwhile, I was able to get them and upload them into your TR for you. Nice report - awesome that you both are so in sync in terms of how to do Vegas. Nice way to spend your anniversary. I agree that its worth it to spend a little extra to get exactly what you want. Congratulations to you and your wife. thanks for the TR, glad you gals had fun. That lakeside view from Prime is great. What were the minimums in the players lounge? Enjoyed your trip report and the pictures! Thanks for sharing with us. I agree about paying more if you have to to get the exact experience or product you want. I love the food pics. I splurge on great food when in places like Vegas. I also like to visit the higher end buffets in town because they offer much more variety and better quality. I must admit though it's sad to see how small the crab legs are nowadays. Seems to be the norm no matter where you go. And the prices....as the crab legs get smaller the prices get.....bigger!! Really nice TR, thanks. Looks like you guys had a great time accompanied by some super food.